tradition of masqueraders was not typical of this region earlier (it was developed by Samogitians), the celebration cannot be imagined without masked characters now. Traditionally, masqueraders are running about, improvising, singing, playing music, dancing, playing pranks, making noise, mocking people's flaws and weaknesses. This year's celebration took place on Jonas Hill, where masked and non-masked participants took part in orienteering competition of masqueraders and relay race organised by Lašininis and Kanapinis. 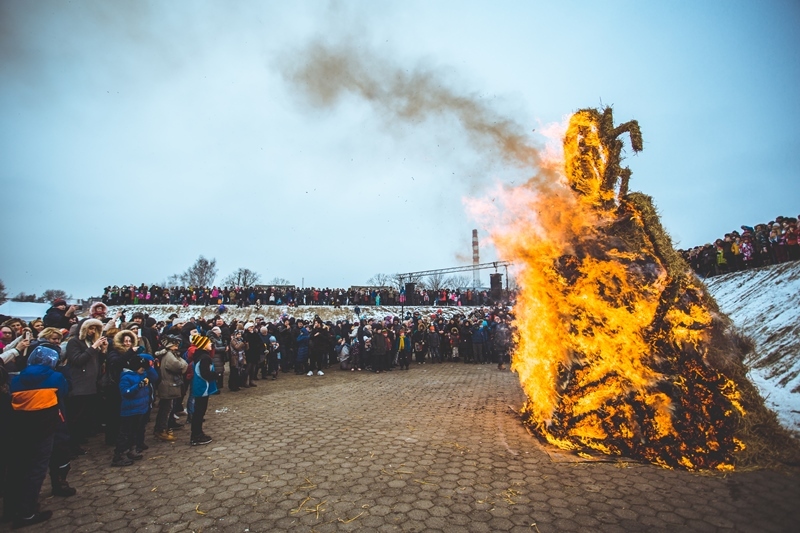 The celebration culminates in the burning of a stunning effigy of winter, Morė. The organisers are looking for new, attractive forms of presentation that would reveal the tradition and be of interest to city residents and guests. The organisers are also pleased that increasingly more volunteers join in the preparation for the celebration, Klaipėda city schools and leisure centres show initiative, too.